Myths are refl ections of cultural values, convictions and traditions of the people among whom those myths are current. Sociology and anthropology as well as many other areas of study of the various people, past or present, gain a great deal of knowledge through investigating myths. This is particularly true about cultures that are now extinct, gone for ever. Myths are as old as the human being. They go back to the times when myths were regarded as a sacred part of the society. Even though the meanings behind ancient mythologies often go back to prehistoric times they nevertheless enter our modern literature, philosophy, religion, culture and arts. Thus we can fi nd the footprints of mythologies in the design of many forms of traditional arts today, among them Iranian handwoven carpets and we should understand these meanings to appreciate the true artistic value that has gone into them. 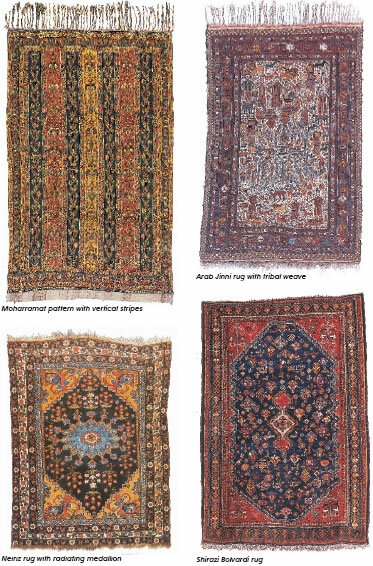 Myths fi nd their way into Iranian carpets depicting natural or symbolic designs used in combination. By surveying them, one can gain insight into the selection of the carpet designers' particular messages that they wish to convey through their work. For example the tree and its details, water, sun, animals …can all be mythological symbols and are often used in many artistic works including Iranian carpet designs. 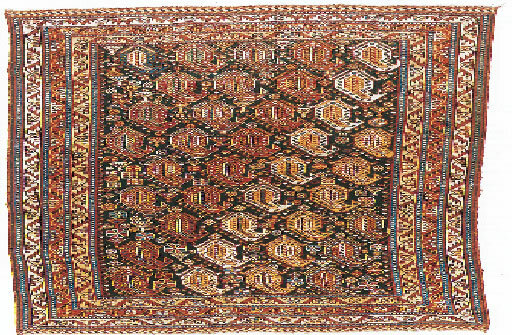 This relationship between form (design) and meaning (myths) is one of the main factors of aesthetics in Iranian hand-woven carpets. Myths are so often used in Iranian traditional arts that one could say Iranian arts are more symbolic than realistic. Since the characteristics of Iranian arts are compatible with each other, the Iranian artists frequently use these myths in their arts. According to Aristotle both wisdom and practice are needed to produce a work of art and this can be clearly seen in Iranian carpets. Among Iranian artists, wisdom is known as meaning and practice as form. The circle, for example, is the symbol for speech. In mythological thinking the circle is also the symbol of the world, life, the female or celestial bodies. The main basis of the design of many Iranian carpets is the circle. There is a vast world of meaning in these carpets. Their designs make up a written language of a people who wanted to organize the power of their minds and thoughts for future generations. We know that human beings have common senses and ideas otherwise they could not communicate with each other effectively. This is why we can recognize the main idea behind an abstract picture, say, when we see it, read a text or hear a sound, and that is the exact meaning of life which invites us to itself. For this reason the manifestations of the sky, earth, tree, water, sun, animals etc have common roots and concepts although different appearances. For example, in Iranian carpet designs animals know the secrets of the eternal world in mythological language, so they are regularly used in the designs of carpets. Another example is the picture of plants creeping up towards the sky in Iranian carpet designs which symbolizes the journey to the heavens and afterlife. Designs depicting fl ight are another way of connecting the earth to the sky. Sacred numbers too have mythological meanings. For example, the number seven has different concepts in different cultures. The seven steps of Buddha's ascension, the seven stages in Mithraism or Shamanism and the seven stages in Iranian carpets. All these point to the seven stages of purifi cation of the soul towards eternal existence and discovering reality. A reference to illo tempra (fi rst history), in which we cannot fi nd pollution, disgrace or tainting of the earth. structure (the whole prevailing fi gure of design), rhythm (the repetitive coordinated musical pattern), and form (inner relations of components in composition). For example, the cypress tree is an element that is often used in Iranian carpet designs. At times we see it in its basic form. Baghi, Derakhti, Buthe, Golestan, Afshan, Goldani... are the names of some other carpet designs in these three categories. All of them have a special rhythm in their inner patterns, such as the natural structure of the Buthe with Moharrammat rhythm which consists of the cypress tree in repetition. There are many defi nitions of the character and root of this tree according to its shape. But mythology has it that there is something about the relationship between the human being and creation. The earth is the great mother of the human: the human is born from the earth and thus comes to the world. Our mother earth is eternal and the life and the afterlife start from the earth. Mother earth knows the enigma of life and she is the everlasting source of creation. Sometimes the earth is regarded as the goddess of death. Death is like a seed sown in the land and so death is a kind of being although a different kind. Always there is a new life after the present. Death is not the end of all. Sometimes we see the vase in the Goldani carpet design, or we see Heaven with its brooks and beautiful Golestan-Baghi trees, or even just the symbol of a tree: The tree is a symbol of the whole cosmos. The tree of universe means immortal youth, reality and source of life. Thus in Iranian thinking the cypress tree has sacred aspects. Mythological thinking has survived in the design of Persian carpets down to the present day, though the appearance has changed somehow because of the infl uence of modern times. But myths continue to play their role in the design of Persian carpets.